The French government will deploy its military anti-terror force as reinforcements during Saturday's possible Yellow Vest protest. The decision announced by President Emmanuel Macron on Wednesday, comes after last weekend's violent protest by the movement. Many targets by the movement in Paris and other cities included known landmarks and stores or places seen as being elitist, such as the Parisian restaurant Le Fouquet on the Champs Elysées. 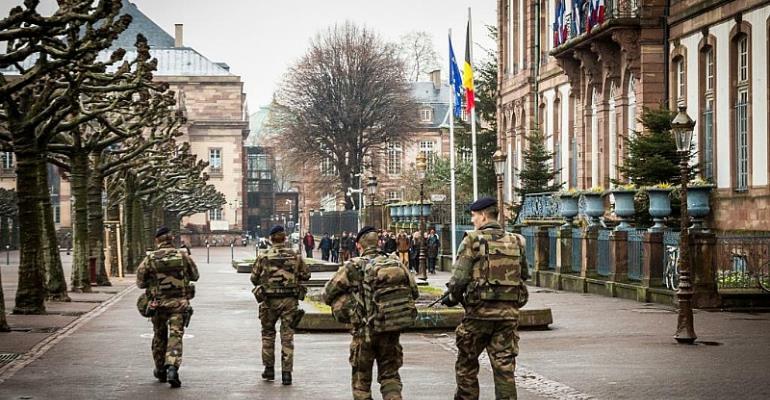 Following the terrorist attacks at Charlie Hebdo in 2015, military officers from Operation Sentinel have been patrolling the streets of French cities all over the country to improve security. And now, they will be dedicated to ensuring security at the expected Yellow Vest protest, which has been held every Saturday for 18 weeks. But last week's demonstrations, which were meant to be the last, turned into the most violent protests to date. After the weekend, the French government sacked the top police official in Paris, 66 year-old Michel Delpuech, for failure to keep the protests in the capital from spiraling out of control. In addition to the landmark restaurant in Paris, more than 100 other businesses were also damaged along the Champs-Elysées. The movement was never meant to be violent, but it has increasingly attracted many far-right and far-left agitators who have been held responsible for much of the violence. And the story isn't repeated in just Paris alone. Major cities dealing from the movement include Lyon, Bordeaux, Strasbourg, Nantes and Nice, to name a few. The capital of the French Riviera, Nice is home to many luxury stores and is often the symbol of the elite in the south. The mayor of the southern French city, Christian Estrosi, announced on Wednesday Yellow Vest protesters this coming Saturday will be permitted to demonstrate in a marked area. On Sunday, China's President Xi Jinping will start his visit to France with a stop in Côte d'Azur beginning with Nice and Monaco. Speaking to AFP, the prefecture of the Alpes-Maritimes region said a defined perimetre will be announced by the Minister of Interior, Christophe Castaner. Although protesters have been relatively calm in Nice, after the damage in Paris last week, officials do not want to take any risks. On Monday, following last weekend's violence, French Prime Minister Edouard Philippe announced that protesting will be prohibited “whenever it is necessary” in the neighbourhoods “the most affected, as soon as we have knowledge of such extreme elements and their will to inflict damage”. For the upcoming protest this week, which will mark the 19th week, calls on social media have singled out Nice, Toulouse and Montpellier.